After encouraging people to “Blow everyone away with the best balloons on the block,” in a commercial aimed at highlighting that, at Party City, you can stock up on any theme, size and color for the best party yet, the retail chain of party supply stores is now offering a glimpse into specific parties. The Unicorn Birthday Party is one of them. 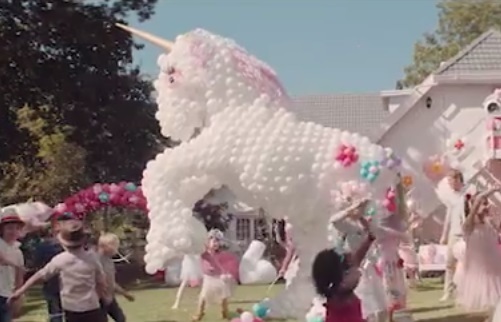 The dedicated 30-second ad opens with several little girls getting out of their parents’ cars like movie stars and walking confidently toward the place where the Unicorn birthday party is taking place. Colorful balloons, pinata, unicorn tableware, unicorn horn hair clips, a kid playing the DJ, and a huge unicorn made out of white balloons are only some of the elements that turn the Unicorn birthday party better than any other party, according to the brand. The commercial, which features DMX’s 2000 hit single “Party Up (Up in Here)”, from his third album, “…And Then There Was X,” ends with the saying “There ain’t no party like a Unicorn Party” and adding the tagline “Oh, It’s On”. Party City offers a variety of items for Unicorn-themed parties, including sparkling unicorn tableware party kits for different numbers of guests, lunch and dessert plates, beverage and lunch napkins, pastel striped cups, magical unicorn balloon kits, unicorn horn hair clips, tassel garlands, letter banners, a wide range of balloons, scene setter with photo booth props, invitations, sunglasses and more.